The metal-elastomer combination gives Reich’s RCT coupling drives high torsional stiffness, as well as dampening shocks and peak torques. The metal-elastomer combination gives Reich’s RCT coupling drives high torsional stiffness, as well as dampening shocks and peak torques. The system is axially pluggable via the elastomer elements which make for easy mounting of the RCT coupling. The elastomer profile is designed for high torque transmission whilst minimising the wear rate and preventing potential noise emissions. This coupling, when combined with a bell-housing flange matched to the specific application is suited as a connection to hydraulic pumps. The RCT could be used in construction and agricultural machinery with hydrostatic drives. The connecting flange is made of aluminium which claims to offer high mechanical strength and dimensional stability. The RCT is available either with a clamping hub or with a backlash-free, splined taper bush. Its compact size is suited to applications where mounting space is limited, meaning the RCT has the flexibility to be matched to existing mounting configurations. Reich-KUPPLUNGEN has developed a range of flexible couplings specifically targeted at fire pump systems used in emergency situations. 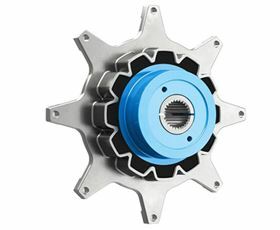 Provides overload protection to the mechanical drive-train.